Twitter just announced some new capabilities in its recently launched Tailored Audiences program for ad retargeting, and it sounds like the company is enabling some pretty specific targeting. In a blog post, Revenue Product Manager Kelton Lynn describes the additions as new ways to create Tailored Audiences, either using a customer relationship management database (something that Facebook added a while ago — in both cases the emails are sent as hashes) or lists of Twitter usernames or user IDs (the user ID being the unique number that identifies your account). Lynn said advertisers will be able to exclude certain audiences from their advertising in the same way. 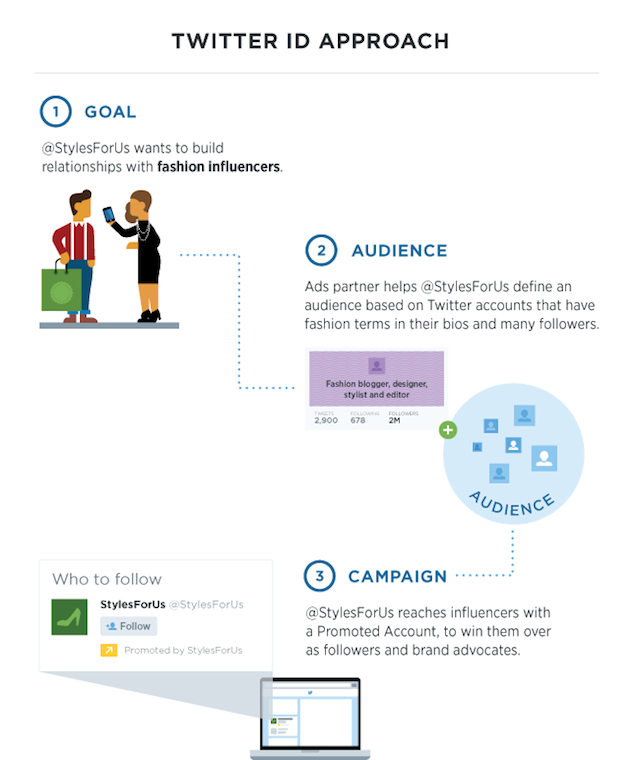 The post includes two infographics outlining use cases for advertiser Style For Us — advertising an exclusive offer to loyalty card members, or targeting users who use fashion terms in their bios and have “many” followers. Those examples suggest that the new features could be particularly useful for targeting existing sales leads or customers, or for targeting people who are influential in a specific category. The combination of these tools enables a highly relevant and useful message for the user and creates the opportunity for you to reach these known audiences on Twitter with more efficient campaigns. [Advertisers] will continue to receive the same reports that include how many users saw, clicked on or converted from an ad, without identifying specific users.